We help you stop grinding your teeth! Bruxism is a common habitual activity – often diagnosed as a sleep disorder – that is characterized by clenching the jaw and grinding your teeth. Occasional instances of bruxism occur in all types of people. Typical causes are stress and anxiety. Often, it’s harmless. But in protracted cases of teeth grinding, the cause is often an abnormal bite or crooked teeth, and the result can be gum recession, permanently damaged teeth, tooth loss, tooth fractures, arthritis in the jaw, muscle pain, and other oral health complications. Due to the fact that many cases of bruxism are frequently misdiagnosed, Dr. Bakhtyari takes great care to spot the tooth wear signs that differentiate unnatural grinding wear from other tooth surface abrasions due to brushing, acidic beverages, and abrasive foods. 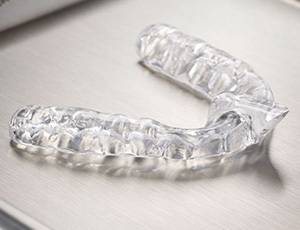 Although there is no cure for bruxism, common treatments for teeth grinding and jaw clenching include the application of nighttime bite strips, mouth guards, and other prescribed oral devices. Since grinding and clenching are habitual activities rooted in stress and anxiety, other methods of treatment include stress management and relaxation techniques. If you have any questions about bruxism, please speak to Dr. Bakhtyari or one of our hygienists during your next consultation.